Google Glass is a computer, and like all computers, it may not always run as well as it should, or an app may not function properly. In such cases, you may want to reset your Glass. When you reset Glass, all data on it is deleted, and all the settings that came on it when it left the factory are restored, so the device is just like new. Be careful when you reset Glass, because when you do, you’ll lose that data forever — with the exception of any data that you downloaded to Glass from your Google+ Auto Backup folder. As you do with any computer, make sure that the important data on your Glass is stored elsewhere (such as your Google+ Auto Backup folder) before you reset the device. 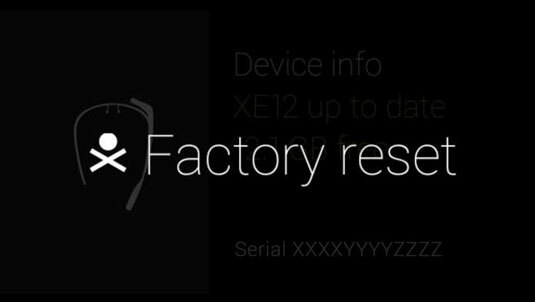 If you need to reset Glass to its original factory settings, tap the Settings card bundle, tap the Device Info Settings card, and then choose Factory Reset from the menu shown. 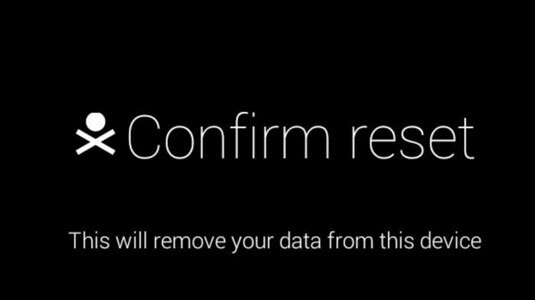 Glass asks you to confirm that you want to reset it, as shown. Begin the reset process by tapping the touchpad. If you want to abort the process and return to the Device Info Settings card, swipe down on the touchpad. You’ll know that the reset process is complete when your Glass displays the setup screen.